In this post, I will explain a handy method to export Trello to Asana. 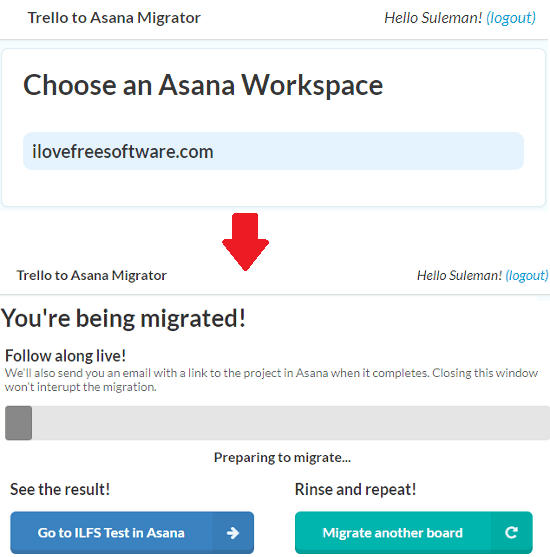 If you want to migrate Trello boards to Asana workspaces then you can use the method I have mentioned below. 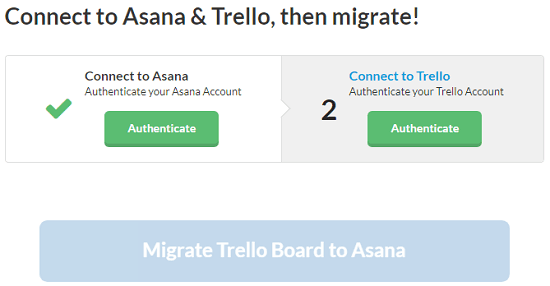 There is a an Asana app called Migrator.xyz that lets you connect your Trello account and Asana account together and then you can transfer boards from your Trello account to Asana. It lists all the boards from your Trello account and workspaces from the Asana. It lets you choose which board you want to migrate to Asana and then does that in a few minutes. To use this, all you have to do is sign in using your Trello and Asana account and go through the wizard like steps to migrate your Trello boards. Asana is a popular project management tool. And if you want to import some boards from your Trello account then you can use this tool that I am mentioning in this post. This is basically a Asana app that you can find in the Apps section of Asana. You just have to authorize using your Asana account and it will take care of rest. After migrating the boards, they will appear in the same state as it was in Trello. After you have a board from Trello in your Asana account, you can do whatever you want. You can assign tasks to any team member or to yourself and simply drag them from one column to another. How to Migrate Trello Boards to Asana Workspaces? 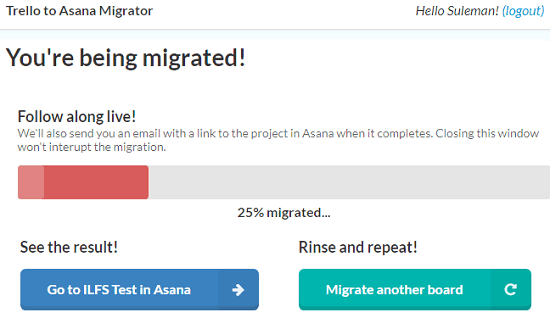 You can find Migrator.xys‘s main homepage here and then you can simply log in with your Asana account. After that, it will ask you to log in with your Trello account. While you log in with you Asana, Trello account, allow it to access the data from your accounts and simply proceed. Now, it will ask you to choose the Trello board that you wish to export to Asana. It lists all boards from your Trello account and you just have to select the board you want to export. Now, after specifying the Trello board, it will ask you to choose a Asana workspace. If there are multiple workspaces in your account, it will list them all you can select anyone from there. Finally select the Asana workspace and finalize the migration process. In the end, start the migration process and see its progress. After it completely exports the selected Trello board, you can find that in your Asana account and then do whatever you want to do. In this way, you can easily export any Trello board to your Asana account. All you have to do is just allow access to your Asana and Trello accounts and this simple app will take care of rest. And in the same way, you can export other board from your Trello account to Asana in just a few clicks. This is the only free method I could find to export Trello to Asana. You can use the simple app which I have mentioned above to quickly migrate your Trello boards. So, just use this simple app and migrate your boards to Asana. And if you know some other way to do it for free then do let me know.